Meal-prep hummus? Why not?! 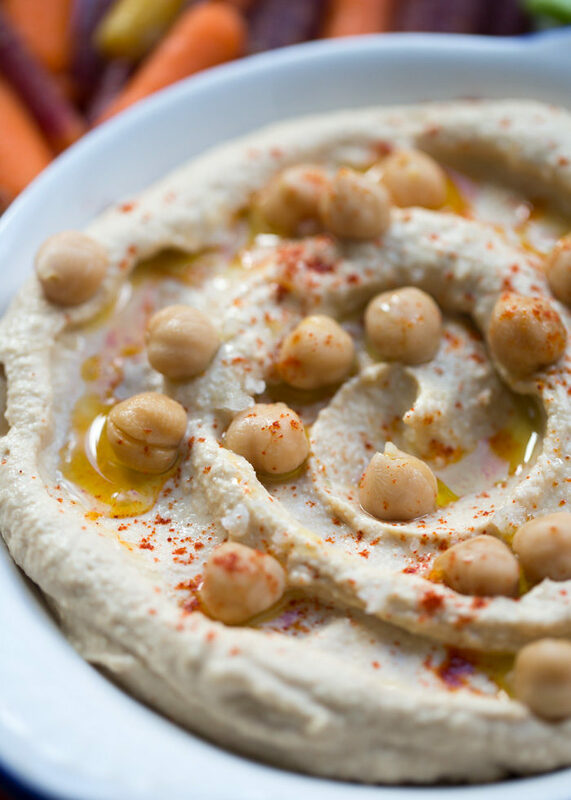 This recipe makes a huge batch of classic hummus that you can keep in the freezer until you’re ready to enjoy. So easy! Here’s the thing though. I am far from a hummus snob. 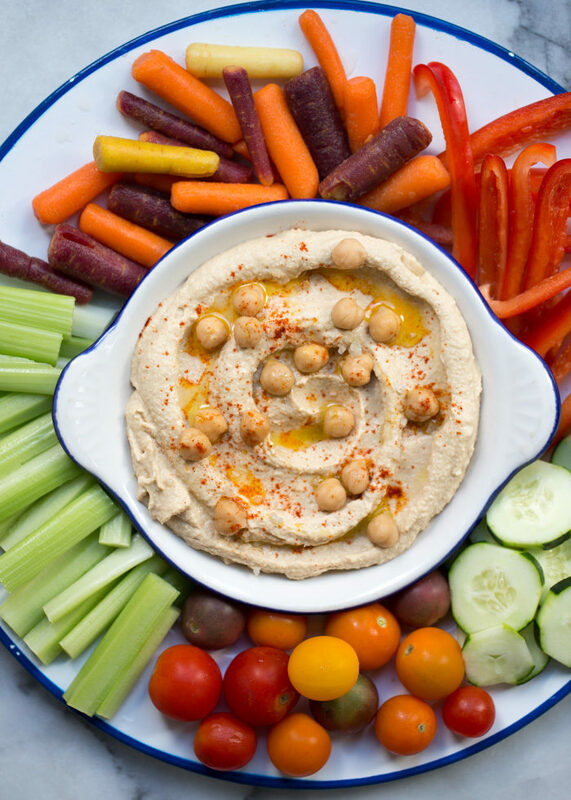 Yes, a sublime whipped hummus is a glorious thing, but no-muss no-fuss hummus? Also absolutely delicious! So I skip peeling the chickpeas (yeah, no) and, for that matter, often skip cooking my own chickpeas. Isn’t it enough that I’m making my own hummus? I really shouldn’t have to spend 6 hours on it, right?! 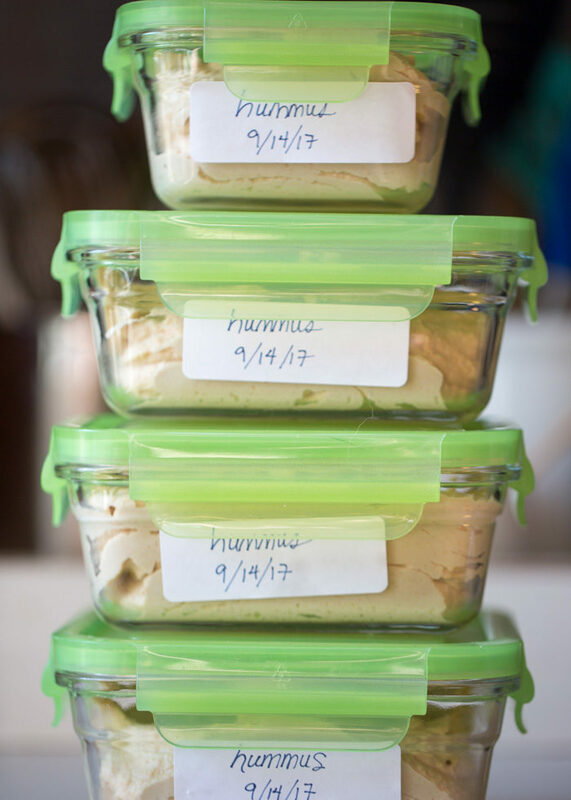 Speaking of time wasted (and time saved), recently, I started making huge batches of hummus, saving a bit out to use, and freezing the rest. Did you know that hummus freezes gloriously? It’s true! I can make one batch of hummus in one swoop and life has never been better. Because I have hummus in it all. the. time. And what is life without hummus? Okay, so here we have my classic hummus recipe, but the batch is tripled. I make it in my 14-cup food processor because my Vitamix? Well, let’s just say it doesn’t like the extra work (I thought I broke it, to be honest, but apparently it just went into thermal override mode – a safety feature that helps prevent the motor from overheating). Point being: Break out your food processors for this one. We have all of the usual suspects here: Chickpeas, tahini, fresh garlic, lemon juice, salt, and chickpea brine or water. Super simple. Blend it all up and divide between freezer-friendly containers. Label if you’re like me and would otherwise look in the freezer a week later and wonder what that stuff is. Or worse, two years later. Um, not that I’ve ever done that. 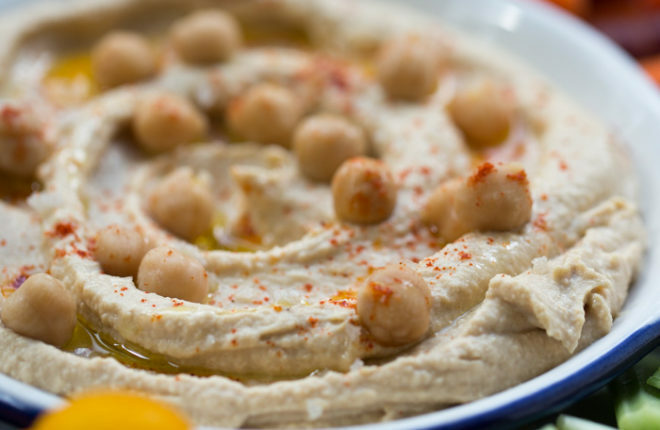 When you’re ready for your next batch of hummus, pull it out and put it in the fridge. It’ll thaw after about 24 hours, and you’re in the hummus zone again! Here’s the downside of freezing your hummus: I do find that once it’s frozen and thawed, it does tend to be a bit grainier. I don’t mind this because it still tastes delicious, but if you want gloriously smooth hummus again, throw it in the food processor or high-speed blender (it doesn’t mind smaller batches) and add a couple of tablespoons of water. Puree for a minute or so and it’ll smooth right out. Mmmm. Hummus is totally my buttercream. Especially when I am able to make a month’s worth of the stuff at a time! 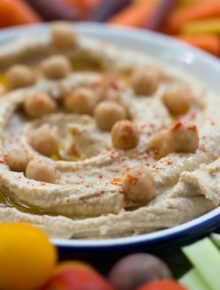 To the bowl of a large food processor fitted with the “S” blade, add the chickpeas, tahini, lemon juice, garlic, 1 1/2 teaspoons salt, cumin if using, and 1/3 cup water or chickpea brine. Puree until smooth. 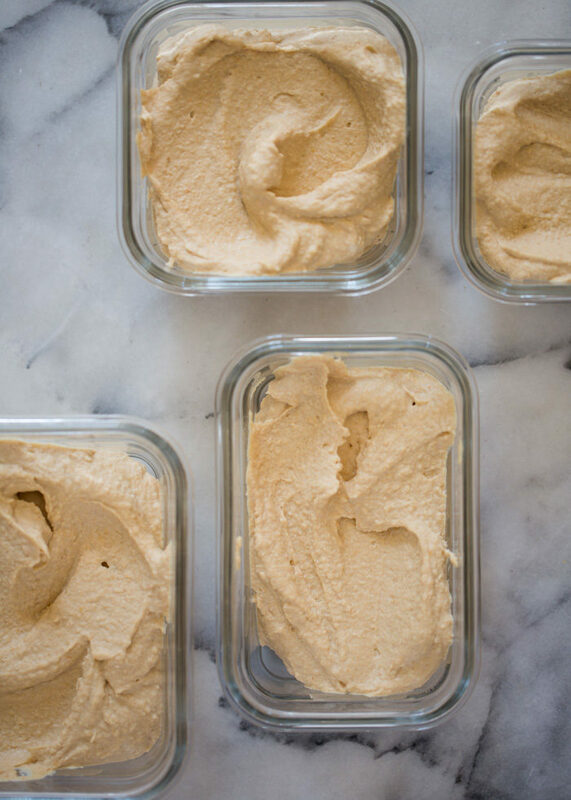 If the hummus is too thick, gradually add more water or chickpea brine until the hummus has reached the desired consistency (I like a nice spreadable yet peak-and-valley consistency like buttercream). Taste and add more salt if desired. To freeze, divide between freezer-safe containers. Top with air-tight lids and add labels (key if you’re forgetful like me). To thaw, transfer from freezer to refrigerator. The hummus should be thawed in about 24 hours. 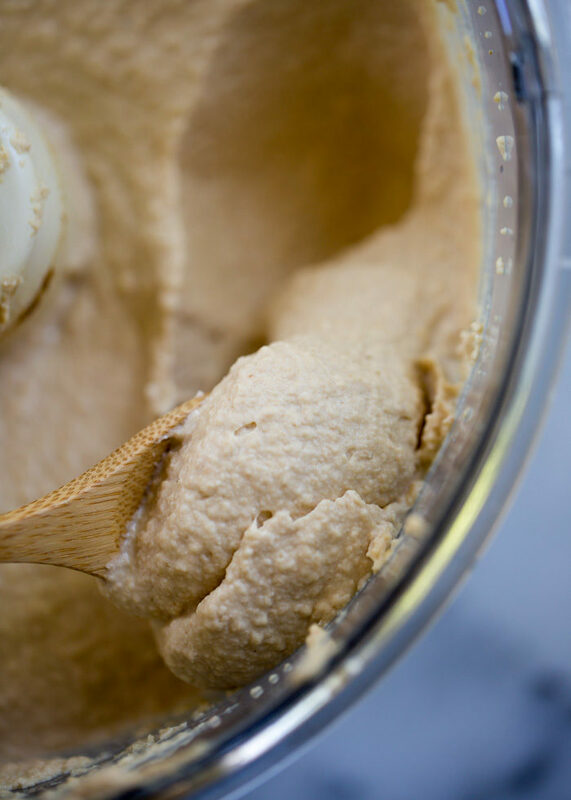 If the thawed hummus seems too grainy, puree in a high-speed blender with a tablespoon or two of water until smooth. Keeps well in the freezer for up to 3 months. So wise ! Thank you so much ! 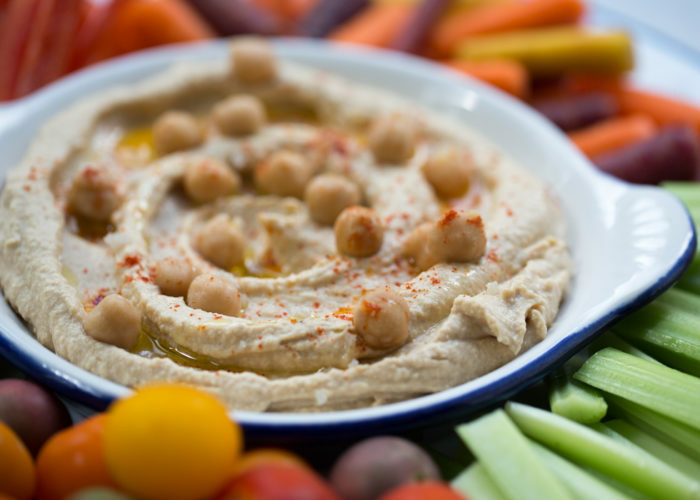 It’s amazing – I didn’t know it’s possible to prepare hummus in large volumes, freeze it, and enjoy every day! Thank you so much! I also thought about this, but hummus is something I eat very often, but in small amounts. I wonder, once it is defrosted, must you eat it within 24 hours? Insomniac, wishing to know if Hummus was freezeable! Thank you for the advice! !I have a case of Black beans!! Made some for neighbors and Wow did they Love it! I added Cilantro! and lime but glad to know that I can use lemon! Thanks again for your information!! This is great 🙂 Today the family wondered if Hummus is freezable. My BF gifted a #10 can of Chickpeas to my brother for the holidays. We also included some spicy seasoning for flavor experiments. The man broke his food processor this afternoon. ‘Not sure how he will manage for the next few weeks?? ?